How does audio production work? 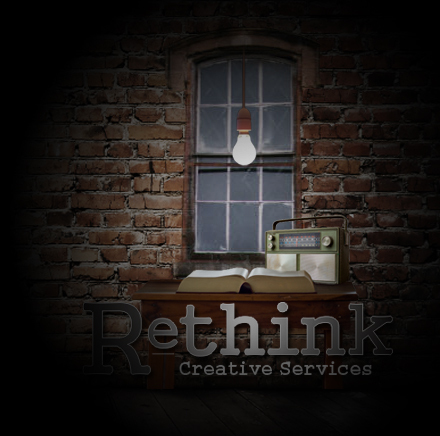 After you contact Rethink Creative Services with your desire to have a radio spot produced, we will work with you (usually over the phone or by e-mail) to get a detailed idea of what you’re looking for. After that, we’ll get to work on writing the first draft of your spot. Depending on the complexity of your spot & how many revisions need to be made, we can usually complete the copy within a few days. From there, after you’ve “ok’d” the copy, production will get underway, and within a few days, your spot will be ready! What do I, as a client, need to do? You will work with Rethink to share with us your ideas, visions and goals for your spot. If you have NO IDEA what you’d like your spot to sound like, that’s ok, too … but if you have a picture in your head, we want to do our best to produce it! Once the writing process begins, we’ll need you to be available to “ok” the drafts, and work with us on edits. Throughout the process, it’ll be in your hands to arrange for airtime at the station(s) of your choice. And then finally, after production is completed, you’ll need to put your final stamp of approval on the project. Rethink will invoice you for your spot with payment due within 15 days. What kind of production experience do you have? EVERY kind! We have over 15 years of experience, much of which was spent as THE primary copywriter & as a producer for a Christian radio network. We’ve written and produced spots for all types of business, churches and non-profit groups. Whether you’re looking for something informational, dramatic, humorous or straight-forward, we’ve done it … and can do it again for you! Why not just get my production done through the local radio station? Well, you can. But think of the last time you listened to the station and heard the “same old stuff” being read with some music in the background. Often, that’s all the smaller, non-commercial stations can give you. In this economy, layoffs and cuts have hit the radio industry pretty hard, and many stations don’t have the staff or skills to produce really good, well-written spots. But that doesn’t mean that service isn’t there for you, or that it’s unaffordable! No — we are a production company. We work with YOU to write really great scripts to accomplish your goals, and then produce high-quality audio spots. Your finished spot is your property, and you can then pursue airtime with any station(s) you like. Can I use my finished spot multiple times? Sure! You can use it as many times, with as many stations, as you’d like – it’s your property to do as you see fit! AND, if Rethink does your spot, we’ll keep all the “pieces” on hand, so if you need an update with just a few minor tweaks or changes, we can do it quickly and easily (ask about rates). CONTACT US FOR RATES – WE LOOK FORWARD TO WORKING WITH YOU! After you contact us with your desire to have us write copy for you, we will work with you (usually over the phone or by e-mail) to get a detailed idea of what you’re looking for in a spot. After that, we’ll get to work on the writing process. Depending on the complexity of your spot & how many revisions need to be made, we can usually complete the project within a few business days. You will work with Rethink to share with us your ideas, visions and goals for your spot. If you have NO IDEA what you’d like your spot to sound like, that’s ok, too … but if you have a picture in your head, we want to do our best to get it on paper! Once the writing process begins, we’ll need you to be available to “ok” the drafts, and work with us on edits. Throughout the process, it’ll be in your hands to arrange for production services (which we offer at Rethink! ), as well as airtime at the station(s) of your choice. Once your copy is completed, Rethink will invoice you, with payment due within 30 days. What kind of copywriting experience do you have? ALL kinds! Our head copywriter has been writing for as long as she can remember, and holds a BA in English with a writing emphasis – few radio stations have that kind of experience on staff. We’ve also been writing copy specifically for radio for over 15 years. Whether you’re looking for something informational, dramatic, humorous or straight-forward, we’ve written it … and we look forward to writing for you as well! Why not just let the local radio station do the copywriting when they’re working on my radio spot? Well, you can. But think of the last time you listened to the station and heard the “same old stuff” being read with some music in the background. That is often all the smaller, non-commercial stations can give you. While most radio professionals would agree that a radio spot will “sink or swim” based on how well the copy is written, the fact of the matter is many stations don’t have the staff or skills to produce really good, well-written spots. But that doesn’t mean that service isn’t available, or that it’s unaffordable! Cassette-to-CD transfers — we convert any personal recording or original studio album into digital format. Note that due to copyright laws, we do not convert non-original studio albums (ie – a copy of an original album, dubbed onto cassette). See Rates. Audio editing for special projects — interviews, audio tracks for video projects, music editing for dance/gymnastics routines … have an audio need? Just ask!